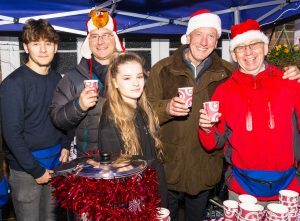 TRADITIONAL festive fragrances of warm mulled wine, hot mince pies and roasting chestnuts were joined by homemade butcher’s sausages and locally brewed beer at the Horsell Christmas Fair on Saturday. 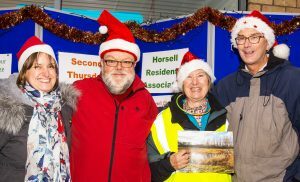 The High Street was lined with stalls selling crafts and other goodies, with plenty of opportunity to give to good causes, such as Woking & Sam Beare Hospices. Musical entertainment was provided by two local choirs – Natural Voices and Octavian – a brass band and the wonderfully named Ukueaholics ukelele band. As the winter daylight faded, community carol singing and the twinkling lights of the Christmas trees provided the perfect festive backdrop. Father Christmas visited on his sleigh, excited children enjoyed getting stuck in to a range of activities, and tea, coffee and cake were provided out of the chilly night air at St Mary’s and The Evangelical Churches.